South Park's Trey Parker and Matt Stone appeared at Microsoft's E3 press conference today to show off their new South Park game, The Stick of Truth. 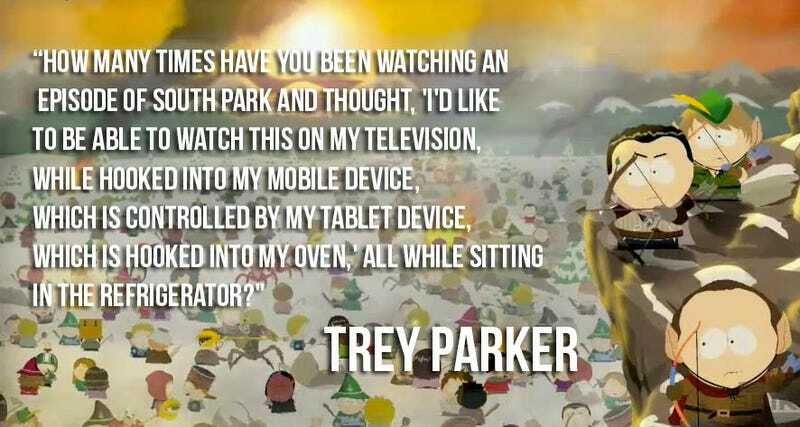 Riffing on the interconnected, multi-screen theme of Microsoft's presentation, Parker asked the house, "How many times have you been watching an episode of South Park and thought, 'I'd like to be able to watch this on my television, while hooked into my mobile device, which is controlled by my tablet device, which is hooked into my oven,' all while sitting in the refrigerator?" Happily, I haven't had to sit in the fridge since moving to an apartment with central air. But Parker makes a point. It's only a matter of time before our houses out-compute us all.